We introduce ourselves as one of the leading manufacturers, trader, exporter and supplier of quality Ladies Bangles made from acrylic and having different shapes/colours with an excellent engraved art of designing with an artificial diamonds. 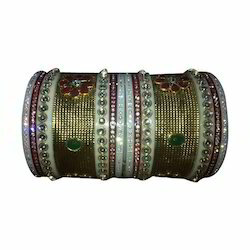 We are engaged in Manufacturing, Trading, Exporting and Supplying the best quality collection of Kundan Bangles, Gujarati Wedding Chura, Punjabi Chura, Bengali Bridal Chura, Designer Chura, Rajputi Chura, Painting Bangles, Miniature Painting Bangles, etc. This collection is beautifully designed by our highly experienced professionals using best quality basic material and latest techniques in compliance with the set industry standards. Further, the offered collection is widely accredited for its attractive look and beautiful colors. Besides, we offer this alluring collection at an affordable cost.